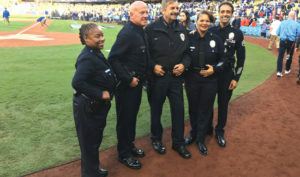 Major League Baseball (MLB) stepped up to the plate to support law enforcement by inviting Houston and Los Angeles police officers to sing the national anthem at the World Series. Four Houston officers had just completed their field training and probationary year when Harvey flooded the city. They survived working 24-hour shifts, catching a nap on the station floor using their uniform jackets as pillows, and rationing food and water, and eating MREs because floodwaters kept them from returning home and stores were closed. The officers saw the tired, shocked faces of citizens coming off boats after being rescued from their homes and witnessed people swimming, instead of walking, into stations. They felt the outpouring of compassion from a flood-ravaged community who brought food and clean, dry t-shirts, socks, towels, and underwear to weary officers. For the first time in their short careers, they covered their new, shiny badges with a black band to mourn a fallen comrade who drowned in Harvey’s savage flood waters. Surviving five days of flooding, they never thought they would become part of the city’s healing and recovery by singing the national anthem at Game 4 of the World Series. For Officers Wendy Caldwell, Vernon Lewis, Katie Muldrow, and Danielle Dempsey, the road to the World Series began with their academy class graduation ceremony last March. When a call went out for cadets to audition to sing the anthem, the four decided that instead of competing against each other they should sing as a quartet. Years ago, the Houston Police Department had a quartet called the Peacemakers that disbanded when the officers retired. The cadets were determined to bring back the tradition. The Houston Blues quartet consisting of (left to right) Houston PD Officers Vernon Lewis, Danielle Dempsey, Wendy Caldwell, and Katie Muldrow sing the national anthem. Muldrow arranged the harmonies for the group: Caldwell tenor, Lewis baritone, Muldrow soprano, and Dempsey melody. Muldrow posted on Facebook that a name was needed for the quartet and they settled on the Houston Blues. 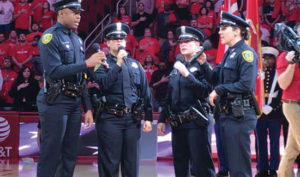 An assistant chief, with ties to the Astros, heard them practicing and arranged for the quartet to perform the “Star Spangled Banner” at a ballgame last June. The Rockets saw a video from the game and asked the Houston Blues to sing for the season home opener. On the Monday before Game 4, Muldrow received a call inviting the quartet to sing at the World Series. The four cancelled their weekend plans and Caldwell had to cut her vacation short. Performing on the field at Dodgers stadium was nothing new for LAPD Police Officer III Rosalind “Roz” Curry. For eleven years after 9/11 she sung the national anthem at law enforcement nights at the ballpark. But in her wildest dreams, she never imagined that she would end up on the field for three games of the 2017 World Series. For Game 1, the Employee Assistant Unit where Curry worked was chosen to hold the large flag on the field to honor the unit’s deployment to Las Vegas after the concert shooting massacre. Curry told the Dodgers if they needed an anthem singer to give her a call, and they did – inviting her to sing for Game 6. The Monday before Game 6, the Dodgers called again asking if LAPD had a group like the Houston quartet. Curry told them that LAPD had a choral group consisting of 30 sworn and civilian employees. The Dodgers and the MLB wanted four in uniform to audition for Game 7. Curry sent out an email to members of the choral group who she thought could meld in that short time span and would harmonize well together. She went with the first three who responded – Ray Morales, Tim Talman, and Michelle Ayerdis. The quartet met on Tuesday morning, spent thirty minutes learning their harmony parts by ear from tapes provided by Talman (Curry soprano, Talman bass, Ayerdis alto and soprano, Morales tenor), and made the requested audition video. The excitement continued for the LAPD Quartet. They appeared on the TV show “Fox & Friends” to discuss their experiences singing the national anthem at the World Series. 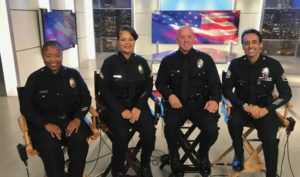 From left to right: Officers Michelle Ayerdis, Rosalind Curry, Tim Talman, and Detective Ray Morales. When the Dodgers selected them for Game 7, they practiced on Wednesday morning before taking the field that evening. The “Star Spangled Banner” is a challenging beast to sing and the quartet didn’t want to mess up what turned out to be an “epic” experience. Eight officers sang the national anthem during the World Series. All eight began singing at a young age in churches, school events and musicals, and choirs. All eight felt honored to sing the anthem in uniform and, not only represent their respective departments, but police officers across the country. “We were representing a bigger entity than just ourselves,” noted LAPD Officer and Air Force veteran Michelle Ayerdis. All eight struggled to calm their nerves as the stadium filled with fans and photographers. Every officer realized the enormity of the national stage they were about to perform on. All eight felt the energy and roar of the crowd rumble deep inside them. A sensation they will never forget. “I will look back at this as the highlight of my professional life as a police officer,” LAPD Detective III Morales said. A thirty-year LAPD veteran, Morales has worked in homicide, vice, and currently in Explosive Threat Investigations in the Criminal Conspiracy Section. He also served in the Air Force. “It was remarkable to have had this opportunity.” “I was overwhelmed with gratitude to be able to represent HPD at the World Series,” admitted HPD Officer Caldwell. 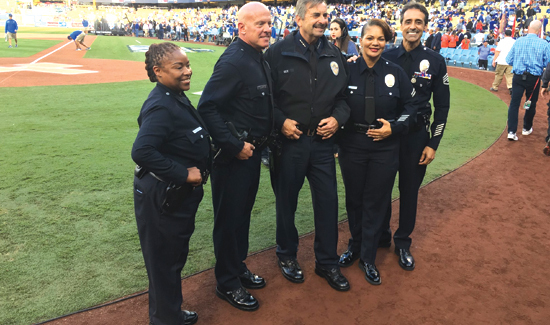 The LAPD Quartet joins Chief Charles Beck on the field before singing the national anthem at Game 7 of the 2017 World Series. From left to right: Officers Michelle Ayerdis, Tim Talman, Chief Beck, Officer Rosalind Curry, and Detective Ray Morales. The Astros and Dodgers surprised the quartets by making special arrangements for the officers to watch the ballgames. LAPD singers watched from the stands and received rowdy towels as gifts. Houston singers watched from a suite and received personalized Astro jerseys. Dempsey and Muldrow, who were riding Northeast Patrol together, had to work the night of Game 4 and called their sergeant for permission to stay which he granted. LAPD Hollywood Vice Officer Talman says there is no bigger Dodger fan than him. Talman, who acted in TV, movies, and plays before joining LAPD, performed in Houston with Theater Under The Stars. “Houston deserved that win,” Detective Morales said, referring to the tragedy of Harvey. Barbara A. Schwartz is a Houstonian and Astros fan. Barbara writes exclusively about the brave officers of law enforcement. She serves and supports those who serve and protect. This article was reprinted with permission of the author from the “Badge & Gun,” the official publication of the Houston Police Officers’ Union.